Scottsville resident Evan Dumrese, 37, looks every part the marathon runner – wiry, energetic, and always wearing a serious pair of Nikes. It’s a bit unexpected to learn Dumrese grew up playing ice hockey and only got into marathoning ten years ago. But he developed a passion for the sport and has the medals, and war stories, to prove it. Dumrese, despite a knee injury, has been training for this month’s Boston Marathon since early January. This will be his second time at Boston; he qualified for the 2018 event in September 2017 at the Erie Marathon. Dumrese trained incredibly hard for his first Boston race, often in the arctic air that settled over our region last winter. His goal was to finish Boston in less than three hours. “I set that goal for myself in 2016 while watching the Olympic marathon in Rio de Janeiro. I was just so inspired by so many phenomenal runners from all over the world,” he recalled. Following last year’s race, the sponsor The Boston Athletic Association reported that nearly 3,000 of the 30,000 marathoners that started the course did not finish due to medical reasons. Another 2,530 participants were treated along the course due to medical issues stemming from the elements. Dumrese says fine summer weather played a large role in his successful training program for Erie. And when it came to race day, the weather – low 50’s, no wind, and overcast skies – this time was on his side. 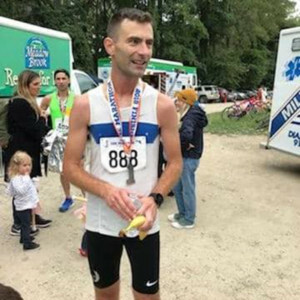 He credits the favorable air and course conditions for a personal best that morning of 2:59:14; this easily qualified him for a 2019 Boston bib. Run like the wind, Evan!